What do Polyglots do for Fun? This year I organized my first major conference: the Polyglot Gathering in Berlin. It turned out a study in how polyglots like to have fun, with nearly 230 participants from 35 countries coming together for 4 days of program. Until now, I had only organized smaller meet-ups or done minor work for bigger conferences (like organizing the “JES al novuloj” scholarships for the Junulara E-Semajno). Then, Richard Simcott suggested at last year’s Polyglot Conference in Budapest that there may be no European polyglot event in 2014, and I decided to pick up the slack. Not alone of course; I had an awesome team of co-organizers, including my friend Martin Sawitzki, who is fortunately very experienced at organizing multi-day events for 200+ international participants. The Polyglot Gathering was a huge success by all expectations and feedback has been so overwhelmingly positive that we’re probably going to organize another Polyglot Gathering next year with only minor adjustments. So what did polyglots come to Berlin to do? Most of the days were spent with lectures and workshops, ranging from beginner-friendly advice sessions like “How to Survive Grammar” (by HTLAL’s Iversen) to advanced “How to Maintain Multiple Languages at Once” (by Richard Simcott). There were also linguistics lectures such as “Language Death and Revival” (by Simon, creator of Omniglot.com) or a session on phonetics (by Cesco) and of course basic language courses for Chinese, Cantonese, Afrikaans, Esperanto and more. You can see the full planned program here. If you weren’t there, we have recorded several dozen lectures and will soon start to post them to the official Polyglot Gathering Youtube channel. Everyone’s passion for languages – no matter how many languages they had learned so far – was apparent everywhere. Because of this, there were also many last-minute additions to the program, for example a basic course of Macedonian, an introduction to Klingon (thanks André Müller! ), lightning talks in Latin, and so on. The aligatorejo encouraged people to practice foreign languages other than English and indeed there were days when I spoke as many as eight of my languages. 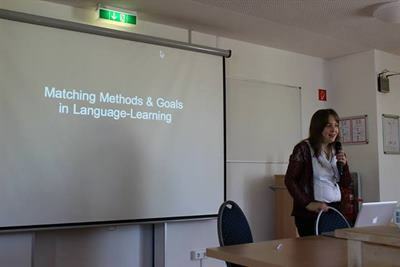 I gave a lecture as well, on “Matching Methods and Goals in Language-Learning”. The evening program was when people really showed their geekiness, for example when it became clear that the people present in the room could translate the word “bird” into more than 60 (!) languages without the help of a dictionary (we had to stop at 60, so the final count is still open). Or when a group of phoneticians led by Cesco sang “Yellow Submarine” with exotic sound substitutions. Or when André showed he could read 10+ writing systems in the Writing Systems Challenge. Or when non-native speakers succeeded in doing tongue twisters like the Hungarian “megnemszentségteleníthetetlenebbségeskedéseitekért”. Also, it seemed like Welsh and Gaelic were the most popular languages for people to present songs and poetry in. As an organizer, I had had the advantage of being able to schedule the lectures and workshops in such a way that it was highlight after highlight for me. But a lot of the fun came from unexpected and unscheduled things like the above. And of course the kind of participants we were able to attract. Wouldn’t you also like to hear linguistic tidbits from Professor Bernard Comrie? Or learn Toki Pona from its inventor? Have Benny Lewis explain how to travel the world on a tiny budget while learning lots of languages? An unexpected highlight for me was when Richard Simcott took the stage in order to sing Disney’s “Let it Go” in 25 languages, a capella and without notes, switching effortlessly between languages as diverse as Dutch, Mandarin, Spanish, Russian, Thai and Hungarian. Thank you, everyone, for making the Polyglot Gathering a dream come true!